Donald Trump’s law-and-order message is strikingly similar to the speech Richard Nixon delivered in 1968. 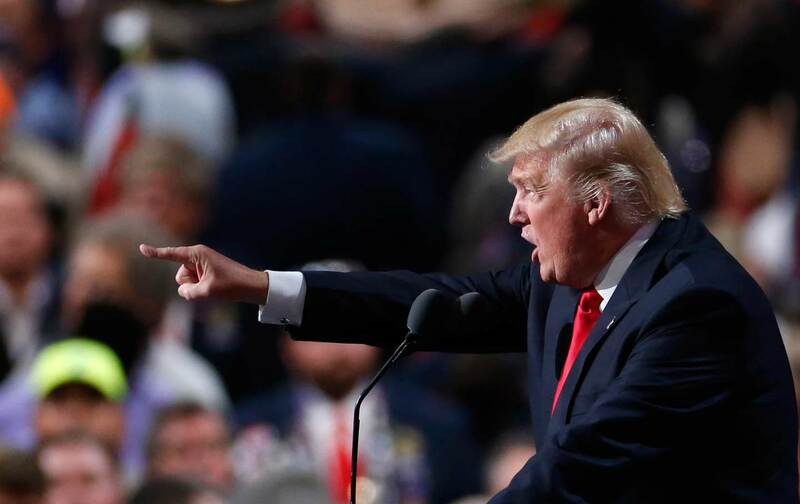 Cleveland—Donald Trump accepted the Republican nomination for president on a Thursday night in the long hot summer of 2016 with a speech that signaled his determination to exploit fears of violence as part of crusade to seize the White House from the Democrats. It will, for those who recall a Republican convention almost 50 years ago. Richard Nixon accepted the Republican nomination for president on a Thursday night in the long hot summer of 1968 with a speech that signaled his determination to exploit fears of violence as part of crusade to seize the White House from the Democrats. The permissive ’60s would end, Nixon argued, with the transition of power from a Democratic administration to a Republican who was prepared to crack down on violence. “Tonight, it is time for some honest talk about the problem of order in the United States,” declared Nixon in 1968. “It is finally time for a straightforward assessment of the state of our nation,” declared Trump in 2016. “The most basic duty of government is to defend the lives of its own citizens. Any government that fails to do so is a government unworthy to lead,” Trump told Republican delegates in 2016. “When the nation with the greatest tradition of the rule of law is plagued by unprecedented lawlessness…then it’s time for new leadership for the United States of America,” Nixon told Republican delegates in 1968. The language is different enough to guard against charges of plagiarism. Nixon was rougher on people who relied on welfare programs, while Trump was rougher on immigrants, promising to launch crackdowns, to build walls, and to “immediately suspend immigration from any nation that has been compromised by terrorism until such time as proven vetting mechanisms have been put in place.” Nixon talked about Vietnam and fighting communism. Trump talked about Syria and fighting Islamic terrorism. But the core premises adopted by Nixon in 1968 and Trump in 2016 are parallel—not just on criminal-justice issues but also on questions about how the United States might project an image of strength on the global stage. Trump’s speech even included an extended riff on the failings of President Lyndon Johnson, the man Nixon sought to replace. Trump is a different man from Nixon. Twenty sixteen is a different year from 1968. But it was difficult to listen to Donald Trump on Thursday night without getting a powerful sense that he plans to run in 2016 as Richard Nixon did in 1968. That should give Americans pause. While Nixon promised to “bring us together,” he actually tore the country apart, adopting a “Southern strategy” that sought to capitalize on resentment over progress on civil rights and voting rights, adopting the bizarre calculus that blames liberal social programs for poverty and hopelessness, ushering in policies that set the stage for a mass incarceration of Americans that now even conservatives recognize as a crisis. The peace he promised at home proved to be as illusive as his “secret plan” to end the war in Vietnam. Nineteen sixty-eight was a difficult and challenging moment in America. The summer of that year saw racial division, clashes in the streets, and traumatizing instances of violence in the nation’s cities. Nixon exploited the difficulties, the challenges, the violence in order to usher in a new politics of code words and backlash. Twenty sixteen is a difficult and challenging moment in America. The summer of this year has seen racial division, clashes in the streets, and traumatizing instances of violence in the nation’s cities. Trump is exploiting the difficulties, the challenges, the violence in order to usher in a new politics of code words and backlash. The parallels point to what may turn out to be the most vital question of 2016: Will history repeat itself?